Hunter River, requires alkaline to neutral soils, well drained and high fertility, spring, summer growing. Sow autumn winter and in temporate areas, spring. 4-10 kg/ha. Attractive cool weather legume. Excellent for stock grazing in mixed pasture and use as a high quality bailed hay. Does best in deep well drained soil as plants themselves are deep rooted and as such plants are excellent for producing organic matter into the soil. As a legume it is used to add nitrogen to the soil in its root nodules. Deep roots can access sub-soil moisture and respond quickly after rain. 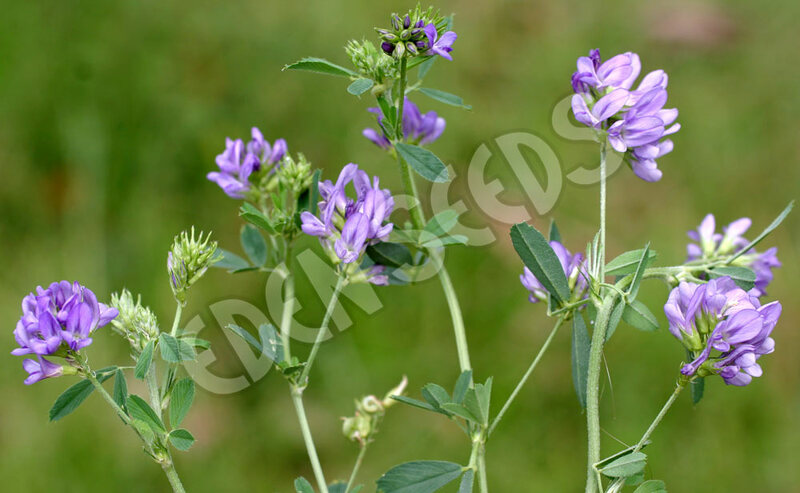 When you buy lucerne seeds from Eden Seeds you will also be given the inoculant needed to add to the seed when it is sown. Young plants can be damaged by grazing so it is best to wait until plants commence flowering and use light grazing rotation to ensure plants are not eaten below 50mm. Soil pH is best around neutral but will produce well above 5pH through to 8pH. TRIFECTA – its low lying habit enables good persistence. Suitable for grazing and cutting. Extended growing season into spring and summer. Moderate resistance to pests and diseases. HUNTER RIVER – old traditional variety introduced by early settlers and widely used until late 1970’s when varieties more resistant to aphids where introduced. As it has a low growth habit it can be more heavily grazed. It extends winter growth into autumn and spring season. Can be susceptible to disease and pests. SEQUEL – good winter activity. Its erect nature makes it suited to hay bailing and will respond if not cut too short also should be lightly grazed. Good disease and aphid resistance.